You are thinking of buying a computer for work but don’t know whether to go for a “cheaper” consumer or home type of PC or go for one built specifically for business use. 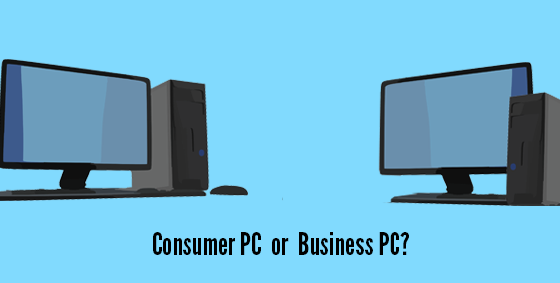 You may have seen business computers with the same brand names that you have at home but that is where the similarities end. Investing in the right system now will definitely pay off in the long term – saving you time, money and a whole lot of heart ache in the future. Below are some tips on what you need to know to make the best choice for your budget and your business. Consumer PCs don’t have the same build quality as business ones, in fact consumer models have a far shorter expected lifespan and they just are not built to last. Business-class computers are built to last with higher quality components that undergo rigorous testing. How will you be using the computer? If it is mainly for home use with a bit of business usage then a consumer PC with the appropriate work software and settings will be fine. When a consumer PC fails, the burden is on the owner to return it to the place of purchase for repairs. Repairs can take weeks and often involve a frustrating process of paperwork and follow up. With most business class machines the warranty is onsite and the repair technician will come to you, often within hours. Business users enjoy a professional experience with priority status and a dedicated support line, all designed to reduce your down-time and get you back up and running faster. Businesses need certain features built-in to the computer and ready to go from day one. These features make your network more secure and you and your staff more productive. For example, fingerprint readers, remote desktop software and in built data encryption tools. The operating system that comes preinstalled on a business-class computer will also have business features while the consumer options don’t. Computers designed for home use come with Windows Home or Starter editions don’t have the ability to join corporate networks. This then requires extra money to upgrade the software and configure the computer. Still confused then save money and heartache now and talk to us today on 08 8326 4364 about choosing the right computer for your needs. This entry was posted in Hardware, Marketing, Tips & Tricks and tagged business, class, consumer, grade, small business by David Perkovic. Bookmark the permalink.